The Palace of Westminster, commonly known as the Houses of Parliament, is where the government of the United Kingdom resides. 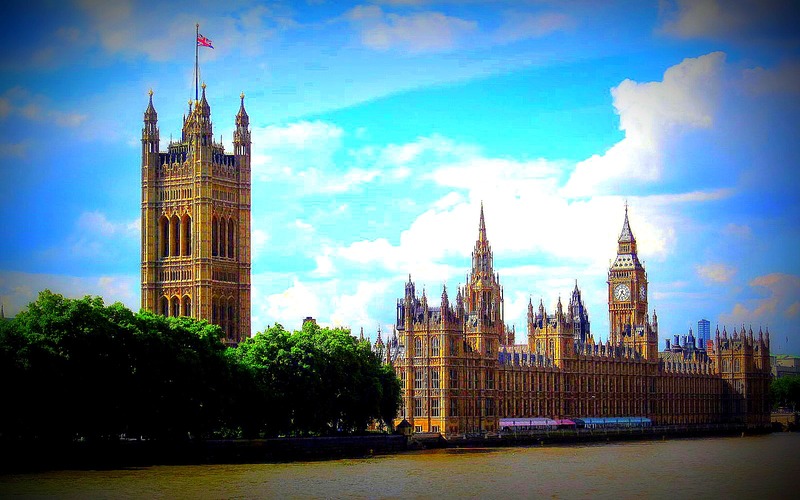 It is made up of the House of Commons and the House of Lords and sits on the north bank of the River Thames. The current Palace of Westminster was built in between 1840 and 1870, as the previous Palace had been destroyed by a fire in 1834. Much like its predecessor, which had been destroyed by fire in 1512. The oldest part of the building is Westminster Hall which, when it was built in 1097, was the largest hall in Europe. There are three towers that are incorporated in to the building; Victoria Tower, the Central Tower and Elizabeth Tower. Victoria Tower, which is 98.5 metres in height, was originally called the King's Tower, but was renamed to honour Queen Victoria. When it was built, it was the largest and tallest square stone tower in the world. Victoria Tower is also the home of the Parliamentary Archives and of the Sovereign's Entrance. It is through this entrance that the monarch enters the Palace of Westminster. The Central Tower, which is 91 metres in height, is octagonal in shape and sits directly above the Central Lobby. It was not on the original plans but was added at the insistence of Dr. David Reid, who was in charge of ventilation or the building. His idea being for this tower to act as a chimney, so as to expel the heat and smoke from the expected 400 fires, that would be used to heat the palace. Elizabeth Tower, which is 96 metres in height, houses the Great Clock of Westminster and its five bells; Four quarter bells, which strike every quarter hour, and the Great Bell of Westminster, which strikes the hours. It is the latter bell, and the Elizabeth Tower, which many people call Big Ben. The original bell cracked while it was being tested and had to be recast. The newly recast bell, which weighs 13.8 tonnes, developed a crack of its own, too, which gives it its distinctive sound. The Ayrton Light, which sits inside a lantern at the top of the tower, was installed in 1885 on the wishes of Queen Victoria, so that she could see, from Buckingham Palace, if her ministers were 'at work'. It is lit when either House is sitting after dark. On the weekend of May 10-11 1941, during World War II, the Palace of Westminster was hit by at least 12 bombs. Westminster Hall and the chamber of the House of Commons received direct hits from incendiary bombs, setting both areas ablaze. Firefighters had to choose which part of the building to save, ultimately choosing to save Westminster Hall. The Commons Chamber and the Member's Lobby were destroyed by the blaze. A smaller bomb struck the Elizabeth Tower blowing the glass out of the south dial of the clock. However, the hands and bells were not affected and the Great Clock of Westminster continued to accurately keep time. The Palace of Westminster is a UNESCO World Heritage Site and the building is Grade I listed.